Sophie: So sad I'm going for lecture alone. I need to pee lor but got no one to look after my things. Chloe: Call me using the 3G thing haha, then leave your phone in front of your things so I can watch it for you. Sophie: HAHAHA imagine someone tries to steal, then a phone starts shouting at him. "AYE YOU! Yes you!!! I SEE YOU YOU KNOW! You better put back the things!!! If not I will.. umm... well umm... But anyway it will be very bad! You better watch out! OI! YOU! YOU COME BACK NOW! I MEAN IT!!!" Rudy: I just got up. Sophie: During the time you were sleeping, I tested the ice mocha at the canteen, learnt ex-president Reagan believes in aliens and discussed my friend's new ex-boyfriend (and the cute boy in lecture). Productivity at its peak! I always read that in this song you can understand the F word... but in my version that doesn't happen." 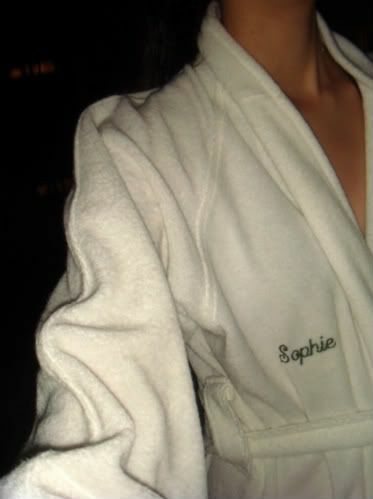 Resurrection of the personalized bathrobe! By the way Year One is insanely stupid. It was mildly funny at times, but a very trashy omg-so-lame kind of funny. And those few funny moments were pretty much encapsulated in the trailers already. Like seriously I'd rather re-watch G.I. Joe or something equivalently average than have watched Year One. Can't wait for G-Force to come out! I know it looks pretty stupid too but the guinea pigs are so cute! (Typical girly teeny bopper vibes here). Byeeeeee.